Association rules are a popular knowledge discovery technique for warehouse basket analysis. They indicate which items of the warehouse are frequently bought together. The problem of association rule mining has first been stated in 1993. 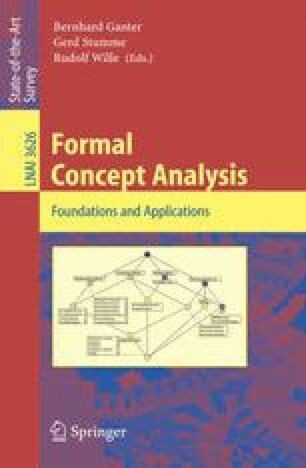 Five years later, several research groups discovered that this problem has a strong connection to Formal Concept Analysis (FCA). In this survey, we will first introduce some basic ideas of this connection along a specific algorithm, Titanic, and show how FCA helps in reducing the number of resulting rules without loss of information, before giving a general overview over the history and state of the art of applying FCA for association rule mining.